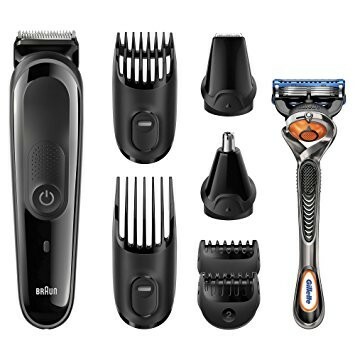 If you're looking for a one-stop solution for all your grooming needs, then Braun MGK3060 Multi Grooming Kit is the best pick. Before getting any further, let's see what all we get in the package. Four combs with 13 precision lengths from 0.5mm to 21mm. Well, that doesn’t seem like much, but this kit is more than capable of handling your complete grooming needs like a pro. The stainless steel blades are sharp and will last you a very long time. The four combs with thirteen different length settings turn out to be perfect if you like experimenting with various lengths and want to adopt various styles without spending money visiting the stylists. You can use the detail trimmer attachment for more precision and detailing. 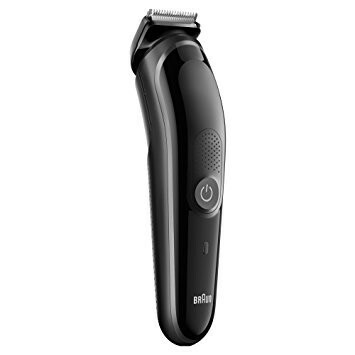 The precision trimmer is more than capable of giving you a sharp and clean trim for all your styles. The nose & ear trimmer attachment can be used to get rid of the unwanted visible nose and ear hairs. Although the battery is more powerful when compared to most of the trimmers out there in this price range, surely isn't the best with the runtime of 60 minutes on a charge of 8 hours. The LED charging indicator is a pretty nifty feature and ensures that you never accidentally run out of battery while trimming. Finally, the trimmer is fully washable under running water for easy cleaning and maintenance. We have talked a lot about the product. Now, let’s sum up the pros and cons. Ergonomic Design for increased comfort. Sharp stainless steel blades which ought to last you a very long time. The four combs with thirteen different length settings provide you with a lot of versatility in styling. The Precision Trimmer is excellent is handling precise trims for more details. The Nose & Ear Trimmer gets rid of all the unwanted visible hair. LED Charging Indicator ensures that you never accidentally run out of juice while trimming. The product is fully washable under running water which ensures easy cleaning and maintenance. The Gillette Fusion ProGlide Razor acts as a bonus and will prove to be a lifesaver if you are planning to go all clean-shaven. The average battery is one of the two downsides to this product. That too isn’t a deal breaker as it is still better than the majority of trimmers out there. The quality of the internal electrical circuits is average and seems to create problems. Overall, this is one of the best men’s grooming kits currently available. You can definitely go for it and it would not disappoint you as it would handle literally all your grooming needs like a champion. If you are going for an all in tool this is a good choice. It has the long charge time and 60 minutes run time so looses a few points there. What is it with these manufacturers and under capacity batteries? It handles the nasal hair job and body with attachments. Don't count the free gillette razor as much but of course it does add some value- less if you buy blades ;) so that has the ability to make this a less value proposition. Throw the gillette thing away when it blunts is my advice. I am happy with mine it is still quite new but it is able to do nose as well as beard trim. You shouldn’t be dissapointed because it’s not too expensive.